The view is looking west toward Union TurnpikeThe photographer is standing in the Long Island Railroad parking lot. The vacant lot on the left side of the photograph is now the site of the Austin Arms Apartments. The house on the right is the old Palmer House, and to its left, the Dean House - both on Newbold Place (today's 82nd Road)In the distance is the future home of Saul Marantz at the corner of 81st Avenue (then called Pembroke Place). I heard about this site a couple of months ago when Andy told me about the reunion he was creatingHe kept me informed of progress and as it got closer it seemed even more excitingI'd planned to be in NYC the weekend after the reunion for something else Andy was doing. Then, my brother Jonny, through my brother Jack, suggested Andy might be more gratified having me at the reunionAfter a conversation I decided to switch weekend tripsThe reunion exceeded my expectations in ways I'll send at another timeMeanwhile, it was just wonderful to have been there and amazing that it remains a binding community for so many. I just review the picture of p.s. 99 year 1966 grade 5 sent by David Silfen I have some names for you that were left out 2nd row firsts unknown Sandra Regina DaSilva The KAren without aa last name is Cairon 3rd row nest to Toni Barnes is Peggy Wolf the other unknown same row is Noriko yagi and lastly Evans last name is Gussack. I haven't had a chance to get to the web site since the reunion. Clearly, Andy London did an extraordinary mitzvah for so many people. For me it was wonderful as well as bizarre to see people go from 17 to 60 "overnight"How mysterious. It was heartwarming to see people known and to meet people unknown but also somehow known. Thanks also to everyone who helped out. My sister, Roberta Haken Rubin, is looking for people from her peer group at P.S. 90/99. Looking forward to the next one. For the record, sister dear, our mother made me return those pennies!!! I just saw the posting by Marion Razler (2002) One of my fondest memories is of your parents' candy store. My grandfather bought his German paper there dailyHe once sent my sister there (who was probably about 6 at the time) and she returned with the paper as well as some pennies. We asked where he got them and she told u that Mr. Razler i so nice - he leaves pennies outside for children. Those were the days when people just left the money on the stand to pay for their papers. They recently built huge apartment house on that site but whenever I pass there I think of Razler, Nevada Butcher, King George grocery. I lived in KG from 1942 until 1954. My mother continued to live there until 1999. Now that the wonderfully successful, and memorable Kew Gardens reunion is behind us,it is time for our 40th R.H.H.S. '65 reunion to get under wayEveryone enjoyed the 30th alot, and some people have been asking me to organize another one in 2005This time,I have recruited a reputable company to handle all of the detailsIf you want to be part of the upcoming celebration, please e-mail me for the latest detailsHave a great holiday season. Once again,I appreciate all of the hard work that was put into making the K.G. event so great. Where are the RHHS graduates class of 1967?? I've been looking for years for information about the Queens School, which I attended from 1969 to 1972. Thank you for the photos, which brought back many memories, and for the address, which will enable me finally to drive past the old neighborhood and show my son where Mom went to school. Editor's Note: One of our viewers has promised to send me more material about the Queens SchoolIf there are any pictures, I will upload them to the Queens School page. David Silfen just called me about this siteLooks kinda cool so farI moved to Kew Gardens in 1965Went to Grand Old PS 99 for 4th,5th & 6th gradeI'm going to see if I have any of my old class photo'sWill send them in if I do. Editor's Note: Because of the way some viewers have their browser set up, recent guestbook updates sometimes do not show up on their screensTo be sure you are seeing the most up to date version of this page, wait until it has fully loaded and then press refresh on your browserThe same goes for other pages on this site that might change from day to day. so, to all my old friends of KG--my brother and I always had this fantasy ,that whoever came from kew gardens would live a long life. === something to do with the water we all drank, and all of Danny's .15 pizza we scoffed down day after day. During those days I couldn't get my weight to go over 145 lbsJust a few weeks ago, I visted the park to say a new year's pray for Anne and Murray, who ashes my brother Matthew and I had peppered down by the old hollow. It seems once you get the KG bug it never leaves you. I spent many a day playing basketball with John in the park and smoking a lot of cigsIt's nice to see this site exists and hope all the old gang are alive and well. Moved to Kew Gardens in 56 moved 66My Grandparents Larry&Rose Serifin, where the super, at 82-46 Lefferts Blvd till 1960 rember shoveling coal in that big boilerMy Father&Mother George&Mary Zabrocki where the super at 83-15 Lefferts Blvd (Lefferts House) from 56 to 66, my Dad was quite a character, he played accordion in several languages, raised rabbits,chickens,crawfish and built a small nursery behind the parking lot of Duffy's BarI have a brother Gerard and sister KathrynWe all attended Holy Child Catholic school in Richmond HillI attended Richmod Hill High, first year in the annex, second year in the main school, then we moved to Brooklyn. Great times in Kew Gardens and Richmond Hill, Remember. Bernieland, Holmstead deli, Duffy's bar, Danni's pizza 15 cents a slice, the laundramat, Gary's bike shop, Forest Park, Dupont Funeral home, DiJulios Italian resturant(My Dad raised rabbits and chickens on the Dijulios property , Maple Grove Cemetery,Wonderland,the fish market, where I hauled out fish for my Dad's nursery, the butcher,the fruit and vegitable market where I hauled greens for my Dad's rabbitsThe drug store, dry cleaners, and candy store on corner. Iwas the paper boy for the Long Island PressI had 2 routes one was Austin StThe other was Lefferts Blvd. Hillside rollerdrome, my friends mom was the cashier and would get us free pasessJahns,RKO Kieths where we got free passs the cashier lived in our building. The Worlds Fair, The Building of Shea stadium, we would get on the field before it was completed a toss a few balls, fishing for carp at Flushing Meadows Park, stickball at PS 54 where I use to blast those old spauldin's into Hillside AvePlaying touch football and stickball in the street on 84th Ave Shooting hoops at the Smirti's garageThe Library on Hillside off of LeffertsThe Iroquois bow men where I learned to shoot a bow and arrowThe bowling alley off Myrtle Ave and Hillside AveThe bowling alley at the begining of Myrtle Ave and Jamacia Ave(the new one). I pumped gas at the Ammaco station on Hillside Ave and Myrtle AveWhat a great site it sure brought back memories. It was the best place to grow upI now live in Long Beach N.Y. THANKS FOR THE MEMORIES. I am a real old timer Kew Gardens-ite. I moved to Kew Gardens (Alt Green Towers) in 1942 - almost right off the boat. I went to PS 99, Richmond Hill High School and graduated form Queens College in 1953. Somewhere in between (afraid to gie the date) my status as an only chld changed when bratty red-headed Evelyne came on the scene! I still am a Queens-ite; live in Jackson Heighta and am involved in many community activities - might call me an "activist". I enjoyed reading the guestbook and looking athe pictures, particularly since I baby sat for some of you - namely John Donavan and his sister Lana and "Matty" Speier and his brother Steven. I attended the 50th reunion of PS99 and enjoyed reminiscing about teacher s- particularly Mrs Goldberg. I am still in touch with two Kew Gardens friends - "Skippy" Mosheim and her sister Inge. Although I did not know her when I lived in KG, I play bridge with another old-timer - not as old as me though - Marian Schild who still lives there. Does anyone out there know me???? I was born in Kew Gardens and lived there until 1965 when I moved to BaysideI graduated PS 99 in 1955 and went on to Russell Sage JHS and then Richmond Hill HS. I am still in contact with many of my classmates and friends even though I now live in Fort Worth, TX. I return home yearly and always go back to Kew Gardens either to see friends or go to the Austin movie theatre. I'll be back there this Dec. and January. My sister and eldest son still live in Queens. I welcome email from anyone who knew me back then. Steve Speier, where are you????? I just discovered this KG site and after an addictive 2 hours on it I find myself stunned at the rather obvious fact that we all carry our early life memories inside us until our dying day, but now we have a truly revolutionary vehicle to gather them all together on a neighbourhood site that allows us to connect and reconnect our memories with others who made up that rather finite community of persons living in Kew Gardens a long time agoI moved there with my family in 1943, when I was almost six. We lived in the Alt Green Towers on Metropolitan Ave. half a block west from Lefferts BlvdReading the commentaries reminded me that the apt. houses all had names, and I recognized so many of them, some where my friends lived, others I walked past oftenIt really blew me away to read about the landmarks that I thought were my personal psychic property so to speak, and seeing that these spots also belonged to others' minds, and as I read further I realized that we all to a great extent shared a common reality and community that is now historyTalking about it here resurrects it, and that feels good, not merely nostalgic, but uplifting, especially when I see that so many of you feel exactly I as I do that it was a great place to grow up. I had forgotten the names of key places I went to, such as Overlook, and when I was a small boy I went to Big Rock at the Metro Ave end of the park. I lived in KG until I got married in 1958, the year I graduated Queens College. My parents stayed in the same apt. on Metro until my mother had to move into a care facility in 1998, my father died first in '93So all the years after 1958 I would always be visiting them in the same place, as though time had stopped whenever I noticed my little canoe still on the bathtub ledge that was never removedTalk about family stability! My father came from a family of 7 children, my mother 9, but they were the only ones to stay put in the same apt. while every one of their siblings moved elsewhere into private homes more than once, to Westchester, New Jersey, Wash. DC, Calif.,Florida, etc. Why they stayed I will never know, but they must have known in 1943 they were moving to a great district, a place they could live in foreverThere is much I can say about those years, about PS 99, RHHS, Forest Park, Queens Blvd., the Austin Theatre in the 1940s, The LIRR, the Homestead Hotel, the village on the bridge over the train tracks and its third rail, etc. etc. I hope to say something about my experiences on this site in the near futureOne question I can ask here is about a friend whose name I very recently came across on a score of Beethoven's Ninth, which I obviously borrowed from her and never returned. Her name was Marjorie Lasher and she lived on the same block as me in the Arden TerraceShe was very sweet and shy and we never got to know each other very well. Anybody know about her? I think it was exactly 50 years ago thatI borrowed the music score. The slideshow is greatThanks for doing a nice jobI am enjoying reliving the day by reviewing the pictures. However,some corrections should be madeI can provide names for some photos tooIf you need this info, please write to me. Once again, thanks for all of the hard work. I just checked out Carol's photo slideshow of the reunionBOY I wish I could have been thereI hope you plan to do it againI'll be sure to fly in from Colorado for the next one. How great to see pix of my friends from 40 years ago. Rosie, Paul, Danny , Donovin and ALL. Youz Guyz havn't changed a bit !!! The park house & B Ball court look the same too. Ah ... Blackjack & DooWop ... those were the days. Carol, thanks so much for posting the photosI hope to see you all next time. Its wonderful to see some many photos and messages from old Kew Gardens. I lived at 83-26 Lefferts Blvd. with my brother, Marshall and sister, Thea. In the 1950's we moved to a house at 119-04 Audley Street, corner of Abingdon RoadIn the 1960's my parents sold the house and moved back to Lefferts Blvd where my mother still lives, so I visit there regularlyRecently we had lunch at Dani's Pizzeria and went to Jahns for dessertI'm looking forward to seeing more photos and messages from old friends and classmates. Editor's Note: If you see any changes that need to be made to the captions in Carol Paplin's Reunion Slideshow, send them to me in an email and I will forward them to CarolI have already forwarded those received since last night. I lived in KG up to 1971 went to PS90, RHHS, final semester at Jamaica High - I now live in AustraliaSorry I missed the RHHS reunion but got a few photos from a friendRegards to all who remember me (Herc). Editor's Note: Danny's mother used to own Mimi's Candy Store on Lefferts BoulevardNot only is Danny a former neighbor of mine in the Beverly House, but I see he now lives in Australia which is where I am visiting until next February. Great idea about this websiteI stopped here before browsing around to see if any folks I know have been here. I just perused the album submitted by Carol Paplin--it was great and I will treasure it foreverThanks Carol a bunch, and it was great meeting you and the rest of the gals!! Thanks Lisa, Next time I'm in KG I will look for Overlook park on the other side of the Hampton courtFrom 1989 till the present I have been developing negatives from my life in KG (1950-1957)that I found in a crawl space in my parents houseDeveloping these pics, combined with my memory and this web site has given me a clearer picture (no pun)of my early life in KGThe picture of me with the Hampton court behind me, was identified via the picture of the HC on this site. Without this web site, the picture of me could have been taken in any playgroundIn fact the 1940 and 2003 pics of the Hampton court were taken from the same vantage point as my 1953 picAnother pic that I have matches the pic on this site titled "south of Metro" on the Lefferts Blvd linkMy picture (1951) shows the side view of both the Barcelona and Lefferts house as well as the private house with the turretWhat an add on to the link, a picture that falls between the 1915 and 2003 pictures on this siteViewing oldkg.com is like opening up a time capsule for me. What an absolutely splendid web site!!! Editor's Note: Howard - if you ever want to send me a scan of that 1951 photo, I'll post it in the main album. we lived behind the rko keiths when we first got married on july 4 1960we always went to the keiths on saturday nights and then we went next door to jahns ice cream parlor to share a kitchen sink with another couplewe still couldnt finish it all. we hung around at jahns a couple of hours talking and we were never thrown out by the owners who were always very nice to all of the kids that were in there. good safe times were had by all. I was born at Kew Gardens General Hospital and lived at The Windsor (although I remember it having a different name) 83-19 116th St. from 1948-1958 when my family moved to Woodstock,NY for a while and then all over the USAMy heart will always be in Kew Gardens and the memories I have of living there are wonderfulI went to PS 90 up to the 4th grade and then to Holy Child. Does anyone remember Miss Dawkins from PS 90? She was my 1st and 2nd grade teacher. I had Miss Cummings for 3rd grade and then Miss Schimmel who I was always in trouble withI remember Rosen's Candy Store which became Shapiro's and Bandies and WonderlandBig Park, little park and the Hillside Skating RinkI took ballet lessons who lived in the building by the little park and there was a piano teacher Mrs. Kuhns across the streetThere was a dry cleaners up on Metropolitan and Lefferts where my cousin John Bucci worked as a kidDoes anyone remember Marcia Cox, Debbie Rowan or Rowand, Bobby Greenberg, Linda Peglow, Gail Johnson or Ruth Olmstead? Dr.Kalina lived in the beautiful house on the corner of Mayfair and 116th. Does anyone remember Dr.Wogel? His office was in the building on the corner of Metropolitan and Audley StWe shopped at the Associated and always went down to Salerno's, the RKO and then Jahn's every SundayMy maiden name was Barbara Broun but it was pronounced Brown so everyone thought it was BrownI would love to come to the next reunion. Editor's Note: Arthur Gelb, former managing editor of the New York Times, has recently published his memoir entitled "City Room"I cannot find the book hereIf anyone has it, I'd love to find out what he writes about the Kitty Genovese story. Page citations would be really appreciated, too. In response to the question about a park/playground at "the two cross streets in the Hampton Court pictures"--I think Overlook Park is the name of the park you're mentioningThere's a small playground at Metropolitan Avenue and Park Lane South which was named Raoul Wallenberg Square, sometime in the 1970s I think; it's near the edge of Forest ParkOn the other side of Hampton Court, up the hill, there is a park called Overlook Park, which has a Parks Department Building on its grounds, as well as a couple of playgrounds, a wide open grassy area, etc. Editor's Note: The current edition of the local Times Ledger newspaper has an article about the Lefferts Florists in Kew GardensYou can read the story by clicking hereClose out the window to return here. I was recently made aware of this site by a friend from the old neighborhoodThis is really neat stuffHearing names from long ago, trying to put faces on the names, remembering old fun activities and the trouble we often caused. Went to PS99, on to Russell Sage JHS anf finally to RHHS, graduating in '70 before going to NYU. Eventually settled with family in Rockland County, NY - so near, yet so far. Have numerous class photos from PS 99, none of which you have listed; if I could get the scanner working I would forward them. Hi to Michael, Ira and Steve - all great guys to go through adolescence with. Would love to hear from others who grew up in KG in that era. Will try to remember who you are, though the memory is often fuzzy - gee, isn't aging fun? Three cheers for you for organizing a terrific reunion and for making sure everyone was having a good time. I never thought I would ever see old friends and acquaintances again...but there they wereWhat a treat the day was and as other reunionites mentioned, the place, food and atmosphere was perfect. I think the next reunion will be even larger as more people find the site and through "word of mouth"Count me in to assist with the planning. For anyone interested,as I stated previously,the reunion was most memorableHowever,the information for me was wrong in the directoryMy phone number was not included,and my address was not rightIf anyone choses to contact me,please do so via e-mailHave a wondeful holiday season. Andy I have been in touch with a few others who were unable to come to this reunion because of work or travel from where they liveWe really need to do this again next yearIf we can pick a date soon, you will have many more attending and it will be another successI have read the reviews and I am sorry I missed this spectatular dayPlease get in touch with me and let me know when you want to do this next year and we can start really earlyI may be in Florida but am willing to do whatever I can. 12:00 we met at the basketball courts on Park Lane South and 80th AvenueA lot of people took pictures, but we didn't take one of all of usIt was really windy so we decided to leave at 1:00 to go to the restaurant. Around 1:30 people started arriving and everyone had to sign in and we all got nametagsThe cost of this was $35 and included drinks, as much as you wanted from about 4 or 5 choices, and a buffet of meats and lasagna and dessert including an amazing chocolate cake, apple pie, and other coffee cakes and coffee brought to your table. The service was excellent at The Austin Ale House, where it was held. The party continued until about 5 and it was still going when we leftAs a funny aside, they have an OTB there and my husband made a little money tooThe place is really nice and the food was excellent with cloth napkins and tableclothsA really great experience for everyone. We should definitely do this next yearEveryone had a great time and a lot of us became very friendly with people we'd never met beforeIt was wonderful seeing old faces and reliving that time. Thank you Andy for all your efforts in putting together "The Greatest" ReunionWhat a trip down memory lane remembering all the good "old" times with all of our friends from the pastI will remember Saturday November 15th for many years to come and look forward to keeping in touch with all who attended and those who could not. Thanks again. Does anyone remember seeing the Long Island Rail Road Crash on November, 1951? I was down below Lefferts Blvd, and killed almost ninety people. I walked down from Kent Manor to the site, as a childThis ofcourse was big news at the time, but Im interested in chatting with anyone, who,like myself, was actually there. Kudos to Andy London for arranging and overseeing our great reunion on the 15thIt was wonderful to see all of my friends after such a long time, and it was very emotional for meHowie--please give me some "Natie Updates" when you canAs they say: you can leave Kew Gardens but it never leaves you! Thanks again to Andy London for his great effort to get us together for the reunionThere was a warmth in the room that day that was heartfelt by allIt was great to see old friends, and to get to know some of the people you may have missed in your childhoodNov 15, may be over but it really is the begining of something newWhat a great day! Thank you Andy for arranging the reunionI had a great time seeing old friendsIt was a wonderful way to spent a SaturdayThe party/web site is a great way to keep in touchLet's do it again next year. Editor's Note: Right now I'm about 10,000 miles away from Kew Gardens with no way to find out what happened at the Nov. 15th reunionI'd love to hear all about it if anyone is willing to email meI'll keep all such emails private. BTW, for as long as I am in Australia, I will try to update the guestbook twice daily - by 7AM and again by 7PM, both New York time. An additional 3000 kudos for AndyI am hard pressed remembering any individual devoting so much time and energy to a pursuit whose sole reward was the joy reflected in the faces, voices and actions of othersYou are one class guy, Mr.London, and you will always have my respect and affectionPeople will be chatting about our "ONE FINE DAY" for quite a while and think of you. This wonderful site has brought back countless fond memories of my childhoodI called Kew Gardens home from my birth in 1947 through my college years which ended in 1968I attended P.S. 90, Russell Sage J.H.S. and Richmond Hill H.SI lived in "The Buckingham Apts." on Lefferts Blvd. with my parents Ruth and Robert and my brother FrankFrank has also discovered this site and is enjoying it as much as I doIt is so lovely to go back in time so effortlessly. Hope to hear from old friends. I am an artist-in-residence at PS 99 in Kew GardensThis is my 3rd year working in the school. I began working on a project when the school was being refurbished by the Dept. of Ed. The row of Gargoyle heads was removed from the top of the building and recast. The old heads were eventually given to the Maple Grove Cemetery. Linda Mayo-Perez, CEO, wanted to give something in return -- I was invited to teach with gifted and talented teacher Roberta Nelson, and the project was born. We are creating a Guardian Gargoyle Peace Sculpture as a community project. It will be life-size, about 6 feet tall and permanently installed in the Cemetery. Last year we completed the design. This year, we are designing the mosaic surface and, most importantly, raising production dollars so we can have the sculpture professionally cast and then complete the mosaic surface. EVERYONE FROM THE KEW GARDENS COMMUNITY IS INVITED TO PARTICIPATE! Our "revival ceremony" to kick-off this penultimate phase of building the sculpture will occur this coming Saturday, November 22. We will meet at 11:30a.m. at the KEW GARDENS COMMUNITY CENTER: 80-02 Kew Gardens Road, 2nd fl. Please visit our website for more information: . We hope to meet you on Saturday. Andy thank you so much for a great afternoonI met some old friends, and found a few new onesI hope we do this every yearI wouldn't want to lose touch with everyone. Like Lenny I wrote a poem to express my thoughtsBefore I post it I wanted to clarify some thingsFirst, I was friendly with Helen Harrison who was Karla Wolfangle's best friendJohn I found your picture and you did sign my yearbookI couldn't find some people in the yearbook, class of '61 Richmond HillI hope next time we can contact more people. Shed years as hours passed. Juvenile pastimes were revisited and savored. Old photos and yellowed yearbook pages. Three Cheers for Andy! You did a wonderful job of arranging for the reunion todayIt was fabulous to meet old friends, and relive fond memories Thanks for all of your hard work, and I know everyone enjoyed themselves. There were plenty of smiles, and alot of laughter,which filled the room with a special warmthThanks again for planning the party, and I hope it becomes a tradition. SURELY BY 2003 WE WILL ALL BE DEAD. 1. Was flagpole hill at the Overlook really the highest point in Queens? 2. Was the big rock down at the Metropolitan Avenue end of the Overlook really a meteorite? 3. Was the old water tower up around 116th street off Metro really haunted cause it sure felt that way every time you dashed across the slate ledge wall surrounding it? Does any one know the history of the water tower? Thanks for the memories and the stroll down memory lane (and Park Lane) and for the opportunity to see a picture of myself from public school. Editor's Note: The Queens Tribune online has a short article on a Kew Gardens resident named Tareq Kabir who is one of the contestants on the television show "Average Joe". To read the story, click here and then open the link entitled "Queens ‘Joe’ A Survivor ". What a great time I'm having reading the messages & reliving the GREAT memories of HOME! I lived on the corner of Lefferts & Metro for 20+ years and went to PS 99, was in the 1st class to attend Russell Sage in 1956. In fact I'm on the cover of the 1956 & 57 Sagebrush yearbook coming out of the school & talking with my friend Eddie Wichta. Wow was that an honor when they asked me to be in the picture. Then on to Forest Hills High(class 1960) where I got together with Steve Susskind, Bob Minsky and formed The Roomates. Loved the echo singing DooWops in the stairwells. Felix Alvarez joined the group and we sure did alot of singing in Forest Park at the basketball courts & park House. Good echo in the tile bathroom there also singing "... that's the story of,that's the Glory Of Love" ! Played a lot of blackjack too, if anyone remembers. 1964 I married Jackie Geiss & moved to Fleet Street in Forest Hills. 1969 we moved to Colorado. Still here, but try to get back once a year.In fact I walked the neighborhood in June 2003 when I came to visit family. My sister Judy still lives in Freeport. She had to go to Richman Hill HS because the school district split.Remember? She was in the class of '62. I would love to hear from anyone that remembers me or Judy. I'll check back here often, this is a wonderful memory lane.I will try to find any photos of KG that I have and post them. I've only come onto this website a week agoI'm in awe of the activity on itI left Kew Gardens many years ago - in the early 1940's - but then to nearby Richmond HillAfter that, married I moved to Franklin Square, Garden City, Whitby, Ontario ?!? !, Montreal, Quebec, then Delray Beach, FloridaFrom there to Concord, New Hampshire and finally Hamilton, Ontario where I now live. Kew Gardens people seem to be mobileAlready I've noted someone who lives in Delray Beach and someone else with a sympatico.ca eMail address (Bell Canada). Any other expats out there? there is a tv show on now called "average joe"...sorta a dating game thing realityone of the guys on there is from kew gardens ... tareq kabir 22 yrs old college professor with a phd. I could be wrong but the manhole looked like it was in front of the main entrance to the Texas Apts. Hear Ye! Hear Ye! - If anyone has class pics from PS 90, especially 1956-57 first grade, please post themThis was my only year going to school in Kew Gardens, prior to moving to Queens VillageI've built up quite a photo history of my early life in KG, but no school picsThe first one to post, gets a free egg cream and If I'm in the pic, I'll throw in a slice of Dani's amazing pizza. Editor's Note: This New York Times article says that the apartment building with the most damage from the manhole explosion was at 123-33 83rd AvenueThat's the address of the Court Plaza Apartments located on the west side of 83rd avenue just north of Kew Gardens Road and south of Queens BoulevardI believe the Park Vendome Apartments (see thumbnail) are directly across the street. You wrote about a manhole cover. What street was this happening on and what apt house had glass broken? I went to the website to read about the exploding manholes in Kew Gardens and I saw the pictures tooI'm not sure where that is, but it looks familiarCan anyone tell me the name of the street or the apartment building? Thanks. Editor's Note: An exploding manhole in Kew Gardens has made the local newsRead about it by clicking here. The Richmond Hill Historical Society will conduct another walking tour of Maple Grove Cemetery in Kew Gardens, NY. The tour is free and open to the public and lasts about two hoursMeet at the front gate at Lefferts Boulevard and Kew Gardens RoadCall 718-847-6070 for further information. My parents first moved to 83-43 118 st (the Arden Terrace) in 1951 right after they got married. I lived in the same building the entire time from when I was born in 1959 until 1992I was there so long I began to think I'd stay until they carried me out feet first someday. One reason I stayed was to hopefully capitalize on the co-op boom of the mid 80s by getting an insider price. Our building was in the process of going coop when the market went bust and fortunately the coop process fell through before anyone bought in. I lived there for the next few years still paying rent control rates (750 for an 1100 sq ft 2 bdr 2 bath 6th floor apt). Then I met my wife, moved to NJ for 8 years then to St. Louis where we live now with our daughterThe best part about living in the midwest is having a NY accentPeople always ask me if I'm from the east coastI tell 'em I'm from Little Rock and they just nod their heads, they're not too swift out here. It was a great neighborhood growing up, but it changed a lot, became very congested especially 118 st. Parking was always murder. My brother used to come home at 2am Sunday mornings from his girlfriend's in Brooklyn, double park, and put the seat back on his 1970 Toyota Corona and go to sleep until he was woken up by the sound of a car starting up (usually around 6-7am)Not recommended now, but the neighborhood was so safe back then that awful parking and car theft were(and probably still are) the biggest problems. I used to park my car about 5 blocks away going toward Queens Blvd and to make this more bearable I learned to ride a unicycle which I would ride to my car and toss in the trunk. There are too many great memories to list, too many people to mention118 st between 84th and metro was a city in and of itself. We had people from all walks of life living at 83-43 and 83-57, it was a real slice of lifeWe had the cat lady, Abe the pigeon man, junkies and people with Phds from MIT. Of course Frankie the good humor man made the rounds. If a kid dropped an ice cream bar Frankie would always give another one for free, and all the girls were "Princesses"We had Gloria, the building crab, who lived on the first floor in the front. She would always yell out in her booming nasally voice across the street to complain about the loud terrace parties going on in the airline building. The people on the terraces would all get together in and chant G-L-O-R-I-A as loud as they could just to taunt her. She also always complained about kids playing in the courtyard. I used to shoot bottle rockets from my sixth floor apt all the way in the back of the courtyard and had the timing and aim just right so that they'd explode right in front of her window. She knew it was me, but that would always encourage me more especially when she'd yell, mispronouncing my my last name: "SIGNOREE, STOP SHOOTIN THEM BOTTLE CAPS". Would be happy to hear from anyone who wants to BS abould the good 'ol days. If someone can tell me what the two cross streets are in the Hampton Court pictures , I would appreciate itI have a picture of me taken about 1953 in a playground with the Hampton Court(Kent Manor)behind meThe vantage point in my picture is basically the same as the pics on this site. I went to KG with my wife and son on Saturday to show them where I lived in the BarcelonaI drove past the Hampton house on Metro on the way back to the Interboro/Jackie R and the only playground/park I noticed was a little sliver with a few benches across Metropolitan from the HCThere is no way that this could have been the park where i was standing in 53Was there a larger playground on the other side of the Hampton Court? If I get the cross streets on the picture in this site, I can locate the place where the pic was taken 50 years agoWhew does time fly! I was amazed to see this "neighborhood" style web site. My late mother's family was from just down the road, the Elmhurst section of Rego Park. Elmhurst, or a good portion of it, was her father's farm. My mother was the eldest, and did a great deal of the farm work. I wish I could afford you a B&W photo circa 1918 of farm field with the 11 children and parents, but I have not received cooperation in obtaining a copy. Thank you for providing such a worthwhile site to visit and to stir wonderful memories. Click on humbnail to enlarge. 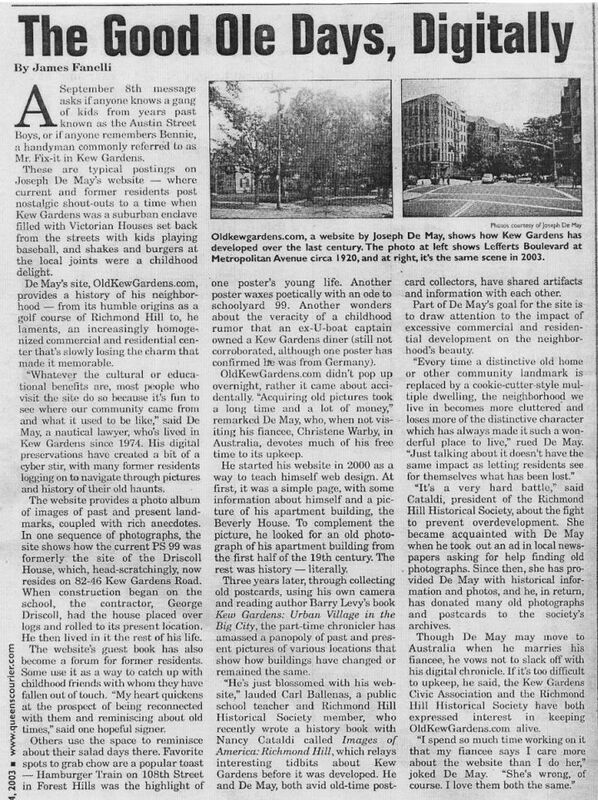 Editor's Note: I don't have much on Elmhurst, but the photograph in the left sidebar shows the Elmhurst section of Queens Boulevard in 1922 at a time when Elmhurst was nothing but farmland and open fields. Kew Gardens was (is) so convenient to the city. The bus at Park Lane So and 115th St took you to the Union Turnpike IND Station and in 30 minutes there you were, in town. And probably because of this we had, as well as a lot of business comuters, some show biz peopleDick VanDyke and his sister Joyce lived (1940?) on 84th Ave west of 115th St.. Harry Stockwell (the voice of Prince Charming in Snow White) and sons Dean and ? lived at 115-25 84th AveIn my time (1939 on) the New York Worlds Fair was on and, with season tickets, we were there every week via that same bus and subwayIt amazes me today to think of 11 year old kids riding public transportation without adult supervision and with nobody"s concern. I've only read the current and previous month Guest Book, and already it brings back long forgotten memories. I lived at 115-25 84th Ave (St Anne's Ave previously and still on the street signs then) from about 1934 until we moved to 109-10 Park Lane So. about 1940Isn't it wonderful when you get to age 76 the way you can remember things way back and not what happened last week(Our phone number was Virgina 7-1165). One of the first items I read in the Guest Book was about an apartment building at Leffert's Blvd and 86th AveThe Jallon's lived on 118th St north of Curzon Road probably a block away. Anne was in my class for all eight years of grade schoolSo was her cousin George McVey, who lived on Curzon Lane. We usuall walked to Holy Child Jesus school together. And the mentions of Jahn's! (that was the RKO Keith Theatre next to it, where the Double Feature was 15 cent for kids on Saturday afternoon). Where are they all today? Who knows, maybe George, or one of the Four brothers, who lived on 116th St just below Metropolitan Ave and whose father owned the Triangle Restaurant, or one of so many friends back then, will trip accross thi site the way I did, with their memories. I hope so. How you can ramble once you get started! I could go on for pages. Wish I could do the 11/15 reunion. I get back to KG now and again but won't be that way in November. How about doing the reunion again, or periodically, and giving us outlanders months and months of notice? The Web site is fabulous. Just proves KG is and was a very special place. I found that my school looked alot better back in 1918 than it does now in 2003. Editor's Note: Congratulations to 10 year old Joseph Corrado of PS 99 who has won a Citywide Reading BeeTo read the online Forest Hill Ledger story about him, click here. To any of my old friends out they're in cyber space, I'm alive and well living in ManhattanI'd love to hear from anyone who sees this posting who remembers meYou can leave a message hear or contact me at Vanchloe@aol.com. Bandies was an eatery where you could get a coke and hamburger for 25 centsAlso the best malts in town were sold there. The owner could remember all the orders taken--he never wrote anything down. The other store across the street was called, depending on how old you are: Rosen's in the 40s; Shapiro's in the early 50s; and then Richmond's long after I moved from the KewThat was where you could read comic books and get an egg cream or soda for 10 cents(No food served)(it was orginally an ice cream palor)We made life miserable for old Mr. Richmond what with all the stunts we pulled. About three hours ago my brother told me about this site and warned me that it would be addictive. It brought back so many memories: being old enough to cross the street (Metropolitan Avenue) without an adult and go to the Little Park; then graduating to the Big Park playground and finally, to the "cool" area where you could watch the boys play basketball at the most important half court; the Big Rock and the stories and fables that went with it; walking to PS99 past what we were told was a Warner Brothers family member's home (does anyone know if that was true); and on to Russell Sage and RHHS (that year Kew Gardens was zoned for RHHS and not FHHS and I thought my life was ruined. It is incredible to read how many people had their lives shaped by so many similar events! Does anyone remember Bandie's? I think that was the name of the little candy shop on the southeast corner of Metropolitan and Audley? We spent a lot of time there (reading pages from books we were not suppose to read while someone distracted the owner). My brother and I used to pool our money so that we could buy one of the $.25 big comic books each week (Archie and Veronica for me) and one of those adventure/action ones for him on his week (it gave me something to read during Hebrew School at Anshe Sholom). I am sure I will be back to this site. Thanks to everyone who has been sharing thoughts and memories. Does anyone have any information about the DiJulio Family? They owned a house on the east side of Lefferts Blvd between Abingdon Road & Metropolitan Ave. They had an Italian restaurant around the corner on Metropolitan Ave. SOMEONE MENTIONED THE SALTY DOG ON METROPOLITAN AVE IN KEW GARDENSIT WAS ORIGINALLY OWNED AND PUT TOGETHER BY BOBBY & KENNY MCINTYRE FROM ST JOHN'S STARDOMA GREAT PLACE TO HANG OUT IN THE LATE 60'S AND 70'SWHEN YOU WALKED IN THE DOOR ON THE LEFT SIDE OF THE BAR WAS A CORNER, IT WAS CALLED POPEYE'S CORNER. WHO REMEMBERS WHO POPEYE WAS? Ed. 's Note: The reason each guest book posting does not appear here immediately is that I review each message individually before posting to eliminate spam or unwanted adult content. Email me if you want to make a correction to a message you have already posted or if you would like a message removed.